Taste test: These are fairly bland nacho cheese tortilla chips. They're OK, but in an age when competing chip makers are constantly pumping more and more cheese onto their tortilla chips, these just don't have very much cheese. They taste good, though, for what they are. 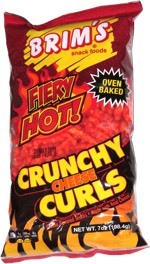 Besides being less cheesy, they're also shaped differently than Doritos. These are cut into slightly tall isosceles triangles, not the equilateral triangles that are typical of nacho cheese tortilla chips. 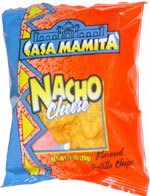 Smell test: Smells like Doritos used to smell before they made them "Nacho Cheesier" and then even cheesier. A mix of cheese and tortilla chip. From the package: Ingredients include Whole Grain Corn, Monosodium Glutamate, Dried Onion and Garlic, Sugar and Paprika Extract.